There’s a risk that we just ask people to ‘talk about stuff’, which is effectively just making the ‘social’ part a bolt on solution, not a truly scaffolded approach. 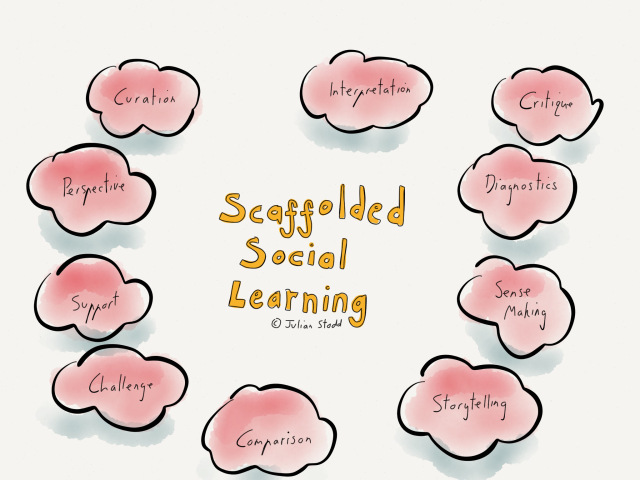 I recently presented a model for the design of Scaffolded Social Learning: it’s a way of combining both formal and co-created components into one coherent learning narrative. The formal elements will be things like workshops, eLearning, mobile materials, assessments, podcasts, reading and so on. The co-created elements are those things that we do within our communities: it’s the ‘sense making’ activity, but i thought it would be worth expanding exactly what this could look like. Siguiente Entrada siguiente: Me preguntaba quienes eran los proveedores de eLearning: aquí va la lista y más..